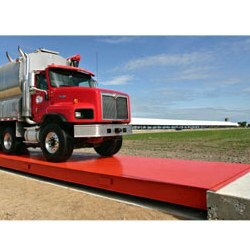 Thurman Diamondback Steel Deck Fully Electronic Truck Scales Featuring an open bottom orthotropic design that forms a super strong low deflection corrosion resistant deck. Scale is rated to weigh up to 135 tons and has a 90,000 lb CLC rating, far exceeding most state max limits. Deck features nine massive 10 and 12 inch I-beams underneath a 1/4 inch thick diamond-tread deck plate. Thurman Diamondback Steel Deck Fully Electronic Truck Scales Featuring an open bottom orthotropic design that forms a super strong low deflection corrosion resistant deck. Scale is rated to weigh up to 135 tons and has a 90,000 lb CLC rating, far exceeding most state max limits. Deck features nine massive 10 and 12 inch I-beams underneath a 1/4 inch thick diamond-tread deck plate. Self-centering double ended shear beam load cell suspension allows the scale to move without damage during normal operation, while always returning the scale to the same exact location. Scale also features interlocking platform design for easy one-day installation. All Diamondback scales come standard with Intalogix Technology, providing full lightning protection and diagnostic ability.